Marcia Ball readily admits that her latest disc on Alligator Records, Roadside Attractions, is her most personal release to date. The first disc she’s ever recorded that features all original writing by Marcia herself, as well as tunes she co-authored with the likes of Gary Nicholson, Tom Hambridge and Dan Penn, Roadside Attractions is a tour de force that will be in my top 10 list at the end of the year and is sure to garner Marcia several nominations at next year’s Blues Music Awards. There’s not a bad cut on the disc and Marcia has surrounded herself with a number of outstanding musicians to assist her in meeting her vision for this project. So let’s have at it. 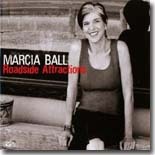 “We Fell Hard” is a love song where Marcia readily admits she fell hard for the man she loves. “We fell hard for each other…you could say we landed on our feet…we fell hard for each other…in spite of everything…it still comes down to you and me!” Thad Scott and the Mingo Fishtrap Horns all lend their talents to the tune and give it a classical New Orleans feel. Marcia finds herself compelled to share advice she learned as a child on our next tune, “Look before You Leap!” The summer heat in Louisiana finds her climbing up a pine tree to jump into the creek to cool off and just before she jumps, she hears her mother say, “You better look…before you leap…you might find yourself in too deep….there might be danger you can’t see…you’d better look before you leap!” Mama’s wisdom repeated itself in numerous situations as Marcia grew older, discovered boys and embarked on many other adventures. Turns out Mama gave her good advice. Marcia could have used Mama’s advice as she recounts her tale of a motel romance gone bad in “I Heard It All.” Marcia arrived early for the tryst and ended up hearing her man arguing with his wife in the room next door. But Marcia’s a fighter and had a few things to say, “I heard it all…through the wall…you were begging her to take you back…I heard it all…through the wall…I never thought you’d do me like that…I told her…he swore he loved me…said your marriage was at an end…and it’s a well-known fact…that if you take him back…he did it one…and he’ll do it again!” Marcia left with her pride intact and that’s really all she could do in this situation. The human condition is a constant one and Marcia lends credence to it in our next song, “Everybody’s Looking for the Same Thing.” “You can’t get it in the lost and found…it’s not hidden in the closet…or buried in the ground…and it will make you sing…I got the world on a string…everyone’s looking for the same old thing…its Love!” Here’s hoping everyone finds what they’re looking for. It’s easy to see why Marcia feels this is her most personal release to date. The entire disc just brims with energy and her celebration of life on the road. Gary Nicholson did an excellent job of producing it and it’s definitely one disc you can throw in your CD player and party all night long to. It definitely will garner Marcia some Blues Music Award nominations for next year and rightfully so. Well done, Marcia! !